Determined to focus on what happened to poor Sarah's sons - Ebenezer the child born at sea en route to Australia in 1867, William, Charles and Edward, I set aside the other wonderful clues in Sarah's Death Registration. More help poured in from Australians who had read my query. The first item to arrive was the death registration index for little Ebenezer. 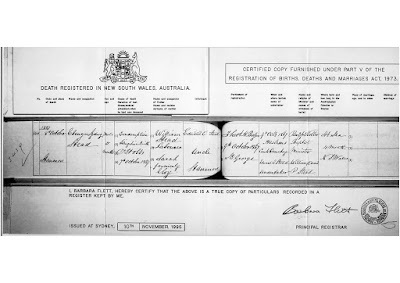 Sending off for the certificate revealed that on 8 Oct 1867, Ebenezer Sydney STEAD, male 5 months old, born at sea, the son of William Stead and Sarah Elvery, died of consumption and was buried the next day at Haslam's Creek cemetery. Poor William Stead and his family! In the space of 5 months he lost his wife, 31 year old Sarah Elvery, and his newborn son Ebenezer. There he was, living at his brother Edward's home in Sunny Corners (near Sydney), a widower with 4 children under the age of 7. What choices he was faced with! Stay in Australia? Return to England? He must have agonized over how he would care for all his children. Research into Sunny Corners, where his brother Edward was living with his wife and young family, showed it to be very isolated. Presumably William knew no one other than his brother Edward. He would need a job, but who would care for his children while he worked and where would he find one? I knew he returned to England, as he remarried there one year later (November 1868). But which children besides my great grandmother Sarah did he take back with him? And who did he leave behind? After a rather lengthy exchange of responses to my original query, and me sending off to Australia for certificates, and searching the 1881 English census (which was not online at that time) I had my answers. Edward Stead, living in Sunny Corners, had a pregnant wife and 3 young children when his newly widowed brother William arrived with his 4 young children and a newborn infant. Edward's one year old daughter Alice had recently died and while William was living with the family, Edward's one year old son Edward Jr. also died. When William's infant son Ebenezer died 5 months later, William makes his choices. It must have seemed very fitting for William to leave HIS one year old son Edward with his brother Edward. Edward's one year old son Edward Jr is dead, now he is being given his one year old nephew, also named Edward. But William only brings two of his four children back to England with him. He also leaves his 8 year old son William Jr with his brother Edward. Thus Edward and his wife (whose name is also Sarah, the same as William's wife) are left with two of Edward's nephews - William (called Will) age 8, and little Edward, one year old. And so my great great grandfather William Stead returned to Kent England with my great grandmother Sarah age 5 and her older brother Charles age 7. I do not know if the families had contact over the years. Did William ever see his children left in Australia again? What is known is that little Edward left behind, married and had a family but died as a young man. The older brother Will appears to have also died as a young man, and never married. Years later I found the descendants of little Edward, who thought that their ancestor Edward was the natural son of Edward and his wife Sarah. But they were puzzled by a photograph (a CDV taken in the mid 1860's) of a young woman which had been passed on down in the family from little Edward. On the back was written "your mother Sarah Stead nee Elvery". They knew that Edward, the undertaker living in Sunny Corners, was married to Sarah Bailey, so who was this Sarah Elvery? For those who have been reading all Parts of Abandoned in Australia, you will recall that my grandmother also had a CDV taken mid 1860s given to my great-grandmother by her father William Stead (husband of Sarah Elvery) with the words on the back "your mother Sarah". Yes it was the identical photograph. William Stead must have given each of his children that photo of their dead mother. And so almost 130 years later two families' mysteries were solved. The descendants of little Edward, left behind in Australia, learned that his parents were William Stephen Stead and Sarah Elvery. Edward had been left at the age of one with his uncle Edward Crunden Stead, undertaker living in Sunny Corners Australia, and his wife Sarah Bailey, and raised as their own. And I finally found out what happened to poor Sarah Stead nee Elvery - my great great grandmother. She died at the age of 31 a few weeks after giving birth to a son on board the ship Light Brigade, just before it docked at Sydney Harbour Australia in May 1867. I also discovered that family lore in this case turned out to be fairly accurate - great great grandpa William Stead left 2 children, Will and Edward, behind in Austrlia, to be raised by his brother Edward Crunden Stead. He returned to England with my great grandmother Sarah Stead, and her older brother Charles. Charles went on to marry and raise a family and I am now in touch with his descendants as well. A young newly widowed William in Australia in 1867 with 5 young children under the age of 7, facing difficult choices when his baby dies a few months later - and being completely deaf - what other choices did he have? Finding work would have been extremely difficult I suspect. I used to wonder how he could leave his sons behind. But now I think I have a partial understanding of his actions and believe that it must have been one of the most difficult choices he was ever faced with. I only hope he was able to see his two sons again but I've found no record of William returning to Australia or his sons sailing to England. Thank you for a wonderful story. I waited for each new episode eagerly. Amazing story. The hardships our ancestors had to endure we will, luckily, never have to endure. Would we be able to do what they did, I doubt it very much. They were a strong breed of people, but then they had to be for us to be here. Thank you for the story and thank you to all our ancestors. I really enjoyed this story, sad as it was. Glad you got so many answers.